A telephone accessory to amplify OUTGOING voice - makes phone conversations easier for people with soft voices AND for the people trying to hear them. Voice amplification that works with most home phones and with most multi-line business phones! Use the Voice Magnifier with standard telephones that have modular (plug-in) connectors on the cord between the handset and phone base. For people with weak or whisper voices, the increased volume of outgoing speech - up to 25 dB gain - means easier conversations with fewer misunderstandings and less repeats. The Voice Magnifier is quick to attach to a phone and is small enough to take along with you to use with a phone at work, at a friend’s or relative’s home or in a hotel room. 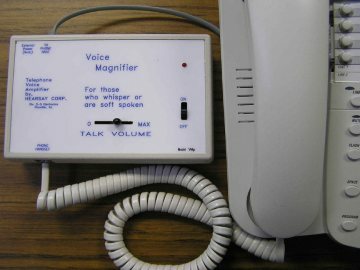 The Voice Magnifier does not get any power from the telephone itself. It uses a 9 V. alkaline battery, which will provide about 20 hours of actual use depending on volume setting. Just flick the switch to "on" when voice amplification is wanted, then to "off" when the conversation is over to save the battery. Also, with the switch "off," people who do not need voice amplification can use the phone without any voice distortion. Another switch allows the user to adjust the Voice Magnifer for good sound whether the phone handset has an older type "carbon" microphone or a newer "electret" microphone. The Voice Magnifier does not work with cordless phones or cell phones and is not guaranteed to be satisfactory for every soft or whisper voice, but it will work with most current phones and with most voices that have at least a little audible output. Dimensions: 5.7" x 3.6" x 1.5"